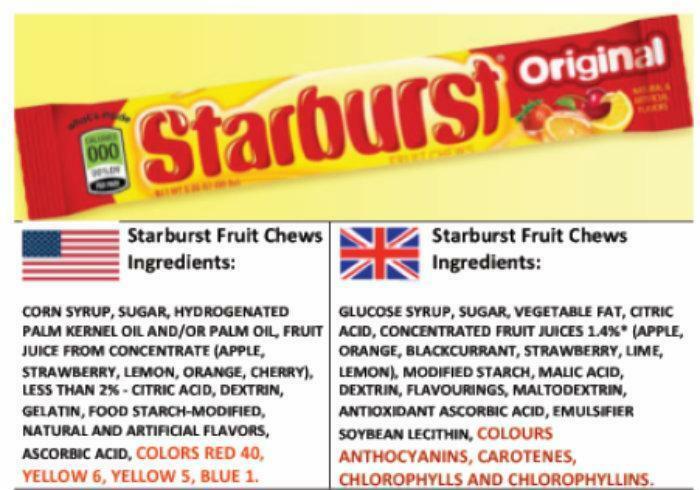 American food and drink companies have stopped using potentially harmful artificial food dyes in food sold overseas but continue to use them in products sold in the United States, leaving American children exposed to what some experts say are behavioral problems and other side effects, a consumer group charges. “Major food companies like Coca-Cola, General Mills, McDonald’s, and PepsiCo should be embarrassed that they’re selling their American customers foods colored with Yellow 5, Yellow 6, Red 40, and other synthetic dyes, even as they’re selling naturally colored or dye-free versions of the same foods in Europe,” said Michael F. Jacobson, president of the non-profit Center for Science in the Public Interest. Jacobson blames the U.S. Food and Drug Administration for failing to protect American children even though evidence of the harmful effects of food dyes have continued to mount since 2011, when an FDA panel last studied the issue. “American children will continue to be exposed to these powerful chemicals so long as FDA lags behind its European counterparts,” Jacobson said. Jacobson's organization has issued a new report that takes a withering look at what it calls the agency’s inaction on dyes. The CSPI cites a growing consensus among researchers and healthcare providers who treat behavioral problems that avoiding food dyes benefits some children. Since 2011, eight detailed analyses, including two meta-analyses, concluded that excluding food dyes, or a diet that eliminates dyed foods and certain other foods and ingredients, reduces behavior problems in some children, the report notes. Furthermore, recent analyses of the dye content of popular foods and drinks indicate that many American children are consuming amounts of dyes far higher than the levels demonstrated in some trials to trigger problems. The report found that most food and drink companies have eliminated most dyes in products sold in Europe, where regulators have required labels warning consumers about the behavioral problems associated with dyed foods. But in the United States, a forthcoming study conducted by a researcher at the University of North Carolina, Chapel Hill, and CSPI found that more than 90 percent of child-oriented candies, fruit-flavored snacks, and drink mixes are colored with dyes. A majority of child-oriented foods made by companies like Kraft, PepsiCo, and General Mills contain dyes, Jacobson said.